And so it came to pass that in the Year of Our Lord 547, in the month of March, the Saxons for the first time darkened the shores of the province of Ynys Medcaut. Passing close by the Holy Island itself, they headed for the mainland in their dark boats and made landfall close to a farmstead. Known locally as Twin Fords, after the two river crossings nearby, the farm buildings must have appeared a tempting target for pillage. However, as they fled from the raiders, the doughty farmer and his family evidently contrived to conceal their worldly goods most effectively. Moreover, they were surely assisted by Our Lord and His holy angels, for when the hordes of the Saxons fell upon the farm buildings they could find no loot within. When the Tribune Aurelius, known as Magnificus (the Magnificent), having been on patrol nearby with his forces, heard the alarm raised, he at once hastened to the scene with his elite Commanipulares. Furthermore he relayed orders to the remainder of his men to make haste in his wake. As an exile from the Lost Lands of Ceint, the noble Aurelius was all too well acquainted with the depredations of the ravening hordes of the Saxon, and knew he must act decisively and with rapidity. On approaching the farm, Aurelius called on his trusted deputy Tutgal to proceed to the easternmost of the two fords with the two groups of Milites, to prevent the Saxons from crossing the river there. Urging Donault Beata (the Blessed) to make best speed in his support, he made his way to the western ford, which was the closer of the two to the farm. So the two heroes, in company with the Comanipulares and three groups of newly-levied Numeri, approached the scene of devastation wreaked by the plague of locusts that were the Saxons. 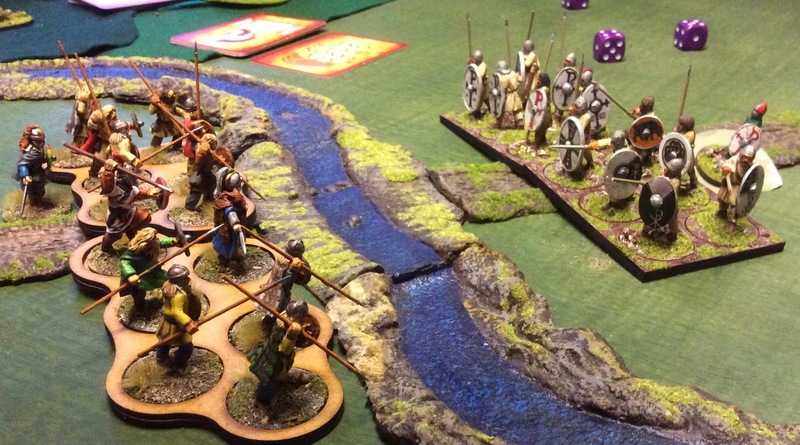 Observing the approach of Aurelius, the Saxon Lord responded by sending a group of spearmen to contest the western river crossing. He also despatched two groups to protect the eastern ford from Tutgal’s Milites. 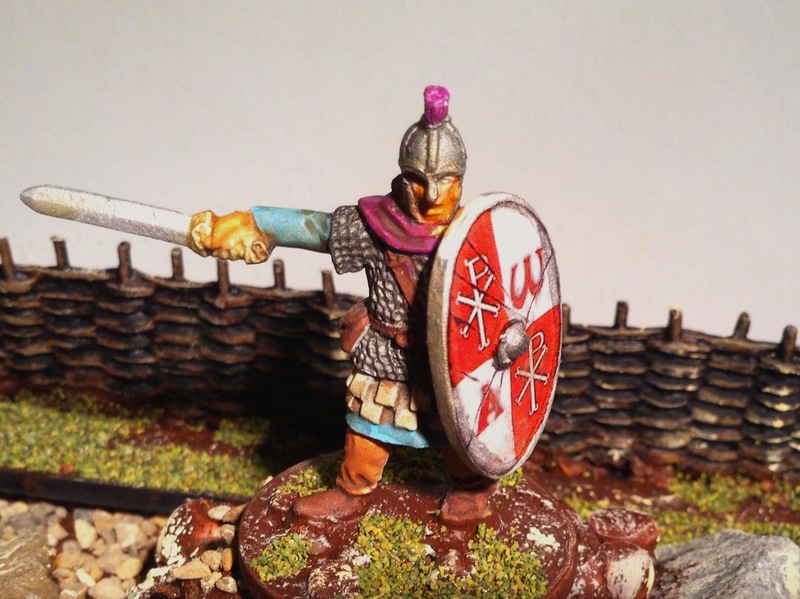 Forming his troops into a shieldwall, the latter bided his time, knowing that Aurelius had instructed him not to attempt to cross the river, but rather to prevent the Saxons from so doing. With a mighty shout the Commanipulares, led by Aurelius and his Champion, Gwalchafed, rushed across the western ford and struck the shields of the Saxon group with their own, thrusting their spears deep into the mass of mail-clad men to devastating effect. But these Saxons were themselves clearly battle-hardened and selected by their Lord for their warlike character, for although falling back they had acquitted themselves honourably and formidably, causing no little concern to the brave sons of Britain. 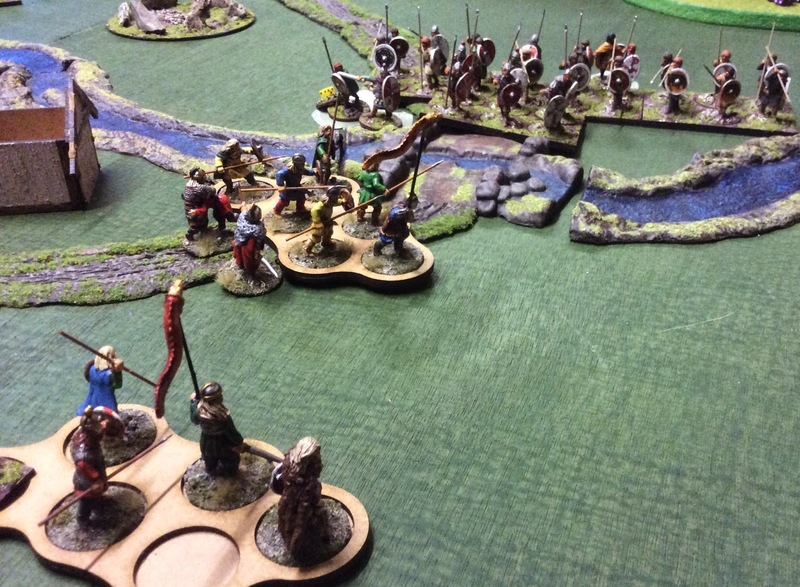 Then a frenzied cry arose from the ranks of the Saxons, and fresh spearmen poured into the fray, throwing a flurry of short spears and other missiles as they came, which sorely discomfited the Commanipulares. And so the clash of shield, spear and sword raged on until the river ran red with the blood of brave men. 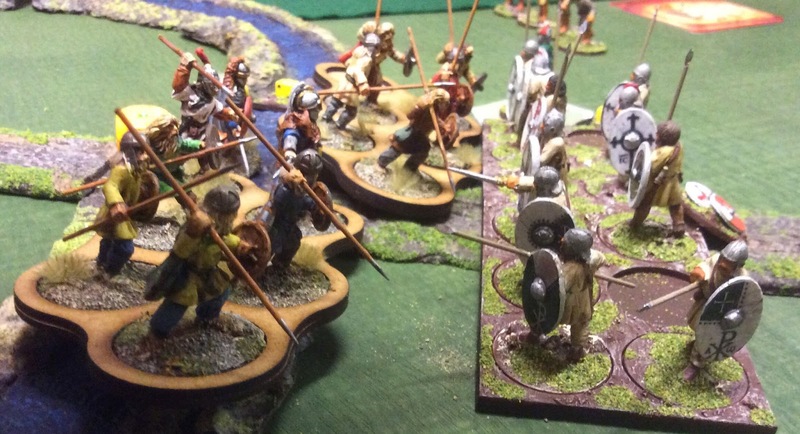 In the confusion a giant Saxon burst through the line of shields and made as if to strike down Aurelius – and moreover would have succeeded had it not been for gallant Gwalchafed, who stepped in front of his Lord and took the brunt of the blow intended for him. Though sorely wounded on his sword arm, Gwalchafed continued to fight alongside his Lord. As the battle raged on and even the strongest of men tired, more and more gaps appeared in the lines on both sides, allowing swords to be thrust past shields with deadly effect. Again the giant Saxon attempted to take the life of brave Aurelius, and although Gwalchafed struck him with a mighty blow that all but killed him, again he was wounded by the Saxon’s sword, this time mortally. Aurelius in his turn avenged his loyal servant with a telling sword thrust that despatched the Saxon, who by the evidence of the angry cries from his countrymen that greeted his demise, appeared himself to be the Champion of the Saxon Lord. 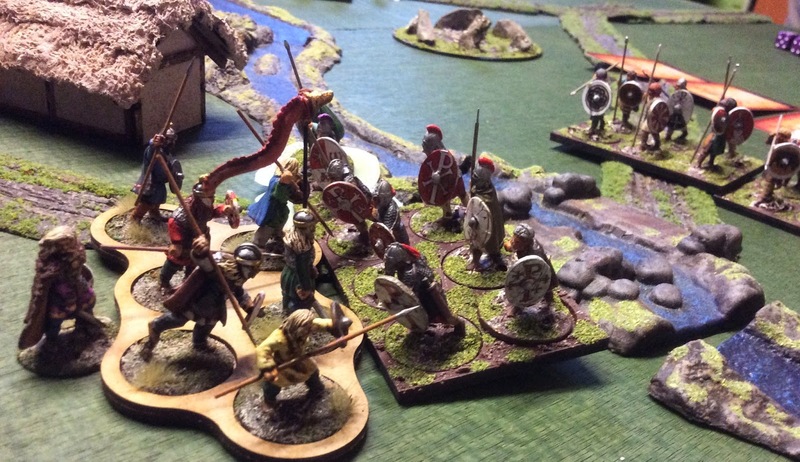 Meanwhile, at the Eastern ford, Tutgal’s shieldwall had been assailed by two groups of Saxon warriors surging across the river. Though sorely pressed, Tutgal’s men held firm, and one of these brave Britons managed to strike a blow on the enemy nobleman who led the attack, wounding him and drawing fierce curses from him and his men. Eventually the soldiers of Aurelius and Tutgal prevailed in their separate struggles. 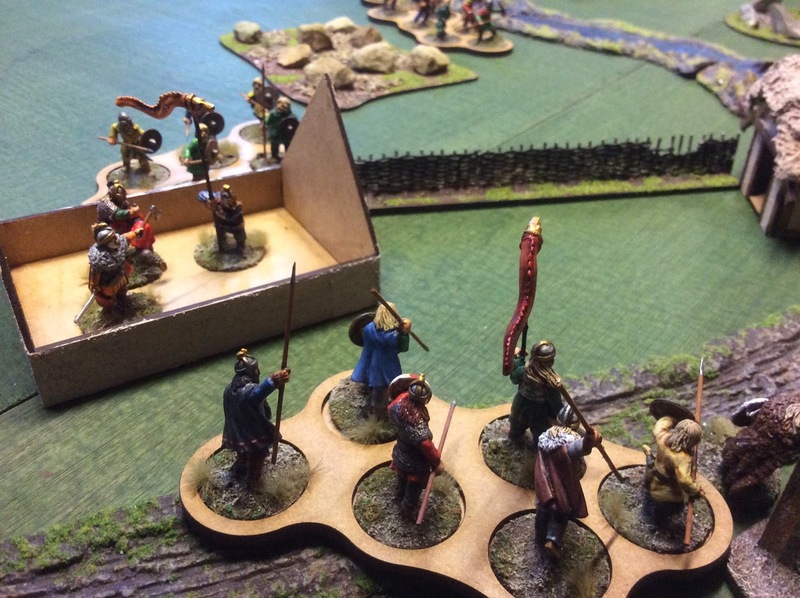 While Tutgal obediently stood his ground as the Saxons fell back across the river, Aurelius seized the initiative and approached the farm, where ever more despondent Saxons were bemoaning the dearth of treasure to be found. However, on seeing him approach, the Saxon Lord ordered his men to call off their search and instead launch a fearsome attack on the battle-ravaged Commanipulares. Rallying his weary men, who were supported in their task by one group of the Numeri who had also crossed the river to stand alongside them, Aurelius fought tenaciously but was eventually forced to withdraw from the battle line. Donault Beata then led another Numerus into the gap vacated by the battle-worn heroes, and though sorely pressed they succeeded in forcing the Saxons into retreat. 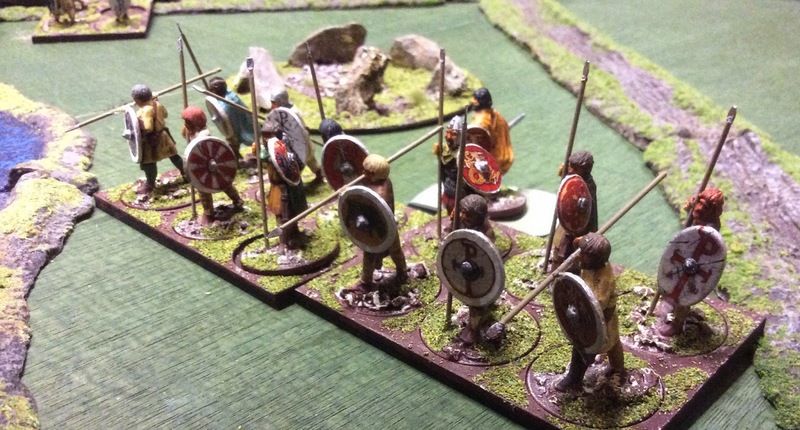 Aurelius, aware that his men had been grievously tested and wearied by a long day’s fighting, allowed the Saxon withdrawal to proceed uncontested, giving his band of heroes some respite to bury their dead, tend their wounded and plunder the corpses of the fallen Saxons. Then the body of Gwalchafed was carried from the field, borne on his shield by four of his closest comrades, and taken back to Ynys Medcaut for a hero’s burial. In the aftermath of the fray, a few youths who had accompanied Aurelius told tall tales of slaying with their slings many Saxon archers and spearmen at the eastern end of the field, near the great wood, but this idle boasting of the common rabble was not heeded by Aurelius or any of his spearmen. For in truth it is said that Victory has many fathers, each claiming the credit rightfully due only to the noble, courageous and pious. The people of Bernaccia will undoubtedly, and rightly, acclaim Aurelius Magnificus for his brave and triumphant despatching of the Saxons from our shores. As Aurelius himself is doubtless aware, however, it is undeniably true that these Saxons, or some of their brethren, will return one day. Let us all pray that that day is far off. by God’s grace Bishop of Ynys Medcaut and loyal subject of King Morgan Bulc of Bernaccia.